We are past Smith’s Yard and the next shop was a tailor and outfitter’s. Here lived Mr. and Mrs. Wass with their son and daughter. They attended the old Wesleyan Chapel in Market Street. 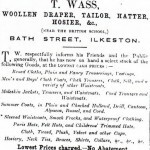 Born in Alfreton, tailor Thomas Wass was the son of cutler Matthew and Hannah (nee Laycock), and married Elizabeth Norman, daughter of John and Ann (nee Grundy), in 1851. 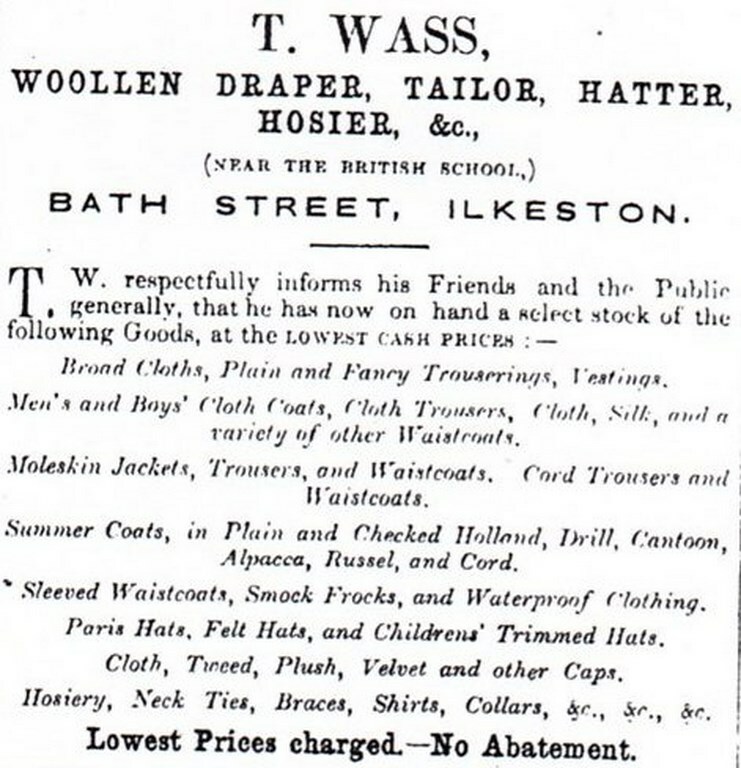 This was shortly after Thomas had moved from Warsop to Ilkeston, where son John was born in 1853. In 1855-1858 he had a shop near to the British School. In July 1861 Thomas moved to new premises nearly opposite the Primitive Methodist Chapel in Bath Street. In 1866 son John died. In 1870 the shop was taken over by clothier John Stinson and his father Charles. It was then 95 Bath Street. The Wass parents eventually retired to Christchurch, Hampshire where Thomas continued as a local Wesleyan preacher. In November 1878 the shop was then occupied by watchmaker Henry Beaumont.